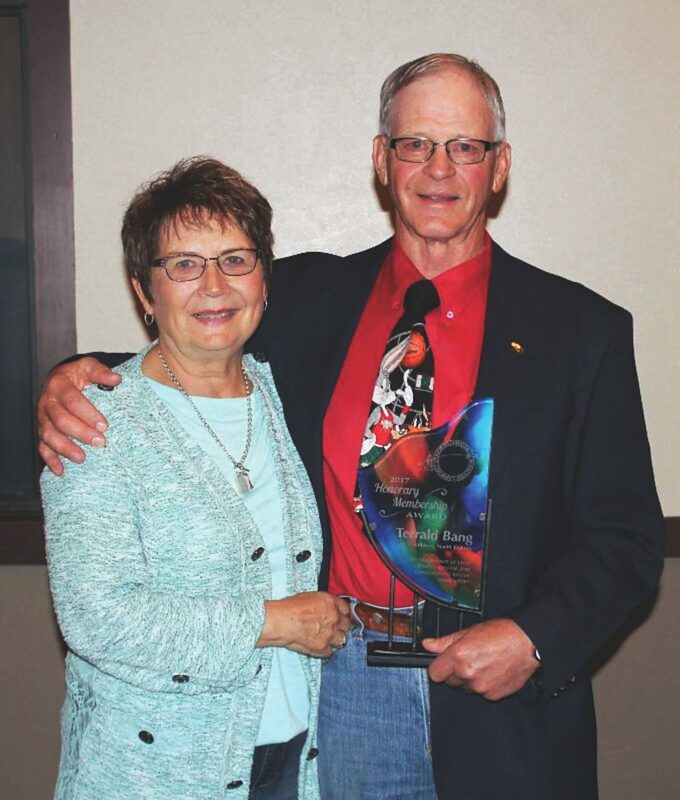 Third-generation cattleman Terrald Bang of Killdeer, N.D., was one of two recognized with the North Dakota Stockmen's Association's (NDSA) Honorary Membership Award at the organization's recent convention in Fargo, N.D.
Bang has ranched in the Killdeer Mountains his entire life. He attended country school and Killdeer High School and, later, Dickinson State College, graduating with a teaching degree. After teaching sixth grade science and math in Dickinson for four years, Bang returned to the family ranch full-time and gradually started purchasing land, cattle and machinery from his parents, Orris and Alice. By 1990, he and his wife Carol had taken over the ranch located 16 miles northwest of Killdeer. Today, the nearly 10,000-acre operation is home to 500 commercial cow-calf pairs and the family's hay and cropping enterprises. Son Todd, his wife Talia and their two children, Cooper and Cassie, are partners in the operation. Bangs' other children, daughter Becki and her husband Josh Anderson and their kids, Jace, Josey and Taylee, and son Taylor and his wife Kara and their kids, Karly and Kelly, also live in the Killdeer area. Bangs focus on carcass quality. They generally contract their calves off the cow in August for a Nov. 1 delivery, but have occasionally retained ownership. NDSA member Mark Voll of Sidney, Mont., who nominated Bang for honorary membership, said, "Terrald has continued the ranching tradition of his grandfather and father, uniquely holding onto the traditions passed down to him, but embracing the modern technologies in agriculture." Bang has been a leader in conservation and grass management, having been recognized as an Environmental Stewardship Award winner for developing water, seeding grass and cover crops and supporting the area's wildlife. Bang has been an NDSA member for 36 years. Over that time, he has participated in many NDSA conventions and Spring Roundups and served on the NDSA Nominating Committee and Membership Committee. "I'm a strong advocate that ranchers need to belong to the organizations that will help us through the challenges we face," he said in 2010. He has taken that to heart, personally recruiting 48 members and earning the NDSA's top recruiter designation in 1995. Bang is active in other industry and community activities as well. He is the president of the Dunn County Fair Board and the 50 Years in the Saddle Club, a director of the Dickinson State University Foundation and a member of the National Cattlemen's Beef Association and Killdeer Mountain Elk Unit Landowners Association. He served on the Consolidated Telephone Cooperative Board, Dunn County Ambulance Board, Dickinson State University Ag Advisory Committee and St. John's Lutheran Church Council. He was also the president of the Dunn County Farm Bureau and a charter member of the Killdeer Area Dollars for Scholars.